Our Soy Votives and Tea lights, just like our massage Candles, are hand poured with products made right here in the USA! 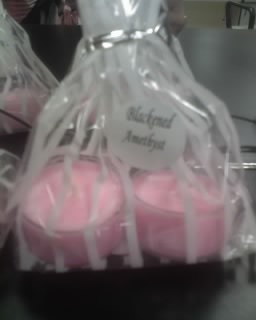 All natural Soy wax and cotton wicks, which burn longer and produce less soot. Our Soy Candles never burn more than 3' degrees more than your own body temperature. And, if you spill our canldes they will clean up easily with soap and water. Soy Canldes are tolerated much more by people with breathing problems, and the aromatherapy is just wonderful! PICTURES of Votive and Tealight Boxes coming SOON! !